I played around with different variables, compositions, color gradient to create a visually harmonious image. At first, I did not know how I wanted this project to look. I just played around with the loop function to draw lines until I came across a design that I could branch off of. I implemented this design that is based off of the concept of light, which includes the source of light in the middle and the rays that come from it. The most difficult part for me was definitely coming up with a design that was proud to create. After that process was over and I could see a clear picture of what I wanted to draw, the rest was straightforward. For this project i wanted to create something that resembles a stage lighting design, hence the creation of this neon color drawing. I thought the corner drawings were actually not as hard as aligning perfectly the middle section (the two horizontal lined triangles). 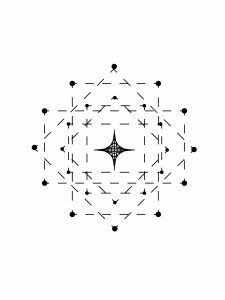 rotate(radians(dotcount * 15)); // rotates about the center -- 24 count of ellipses. 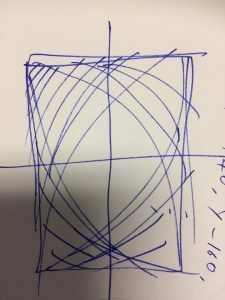 line(ellipX1, ellipY1, ellipX2, ellipY2); // lines follow ellipses. I was inspired by the form and movement of birds during the initial ideation phase of my project, as well as animal nests. In thinking about these two concepts, I developed an interactive mouse-based string work that changes the “form” of the organism inside of the parabolic nest. As always, I used Illustrator to determine my composition (and widths, heights, coordinates) prior to starting the code. When I saw the project, I was reminded of the 2013 Great Gatsby movie poster, and I wanted to make a version of it using the string art. 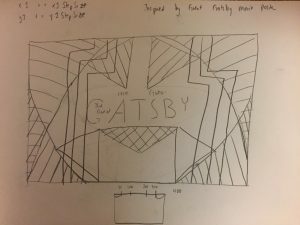 I thought this project was going to be a huge difficulty for me, but after really looking at it and asking tutors, I got a better grasp of the assignment and was able to make better guesses at figuring coordinates out. I tried to use the x1,y1/x2, y2 concept listed in the instructions as well as the x1 += x1StepSize, because I figured it was probably the simplest way to help generate the “curves,” so I could focus more on creating a better design. A really rough sketch of my initial idea. It ended up changing, because I felt like it originally looked too busy. I did have help from the CS pedagogy tutors in trying to figure out how to approach this assignment. For this project, I decided that I wanted to play with adding motion into my string art. I started with figuring out the values in order to make the first loop of lines in the top left corner and used my experimentation with that in order to mirror the lines into the bottom right corner. While I thought that the two looked interesting together, I decided that rather than create two more loops for the other corners, I wanted to create two new series of lines that would start from the same corner but act in a very different way. While playing around with that concept, I came up with the code below. Although I found that I was able to satisfy the requirements of the project, I decided that I was not satisfied with the inconsistent ways that the lines would move, so I restarted and played around with changing different variables. Through more experimentation, I was able to come up with my final code, which appeared more sophisticated in terms of the spacing of the grid it created as well as the monochrome colors. This project was pretty difficult for me to wrap my head around at first… I had never done any sort of string art before, nor could I quite get the feel for it. So, the way I started this project was pretty much playing around with the string art form: trying to make different shapes, and seeing what different loops I could use to accomplish drawing efficiently. Somewhere along the lines, I ended up deciding on an eye as the theme for my drawing. Once I got going, I discovered some of the advantages of using string art, mainly, its ability to create compositional lines. After deciding on the shapes and composition, the next thing was the color and negative space. Negative space was definitely something that I realized later on was a very important part of the string drawing. Originally, all of the space was filled with strings, and the drawing became quickly cluttered. I had to decide on what to remove, and where perhaps I should use less strings to render the shapes. As for the finished product, I enjoy how the strings led to a reptilian aesthetic. The spaces between the lines give the image texture and curvature that would be hard to do otherwise. The iris of the lizard’s eye plays off the geometric qualities of drawing with string art, creating different polygons with the lines and shapes where lines are removed. //Drawn between points along a half circle in the middle of the canvas. //i is an angle measure going from 0 to 90 degrees. I used a lot of circles; the sun’s reflection on the water uses a sinusoidal pattern. I found that string art is simple yet so aesthetic. Numberless lines drawn by mathematics create beautiful composition which makes you just zone into. I wish I could figure out more complicated formulas. This sketch explores using strings to create a gradient curtain on a sine wave. I liked creating this simple interaction where it felt like I was pulling back a sheer curtain of individual lines.